Routers made by the Inland Company under the Wizard and Wizling product names and those made by the Glastar company under various names mostly have the same type of motor shaft, 5/16 of an inch in diameter with a flat spot on one side for the setscrew that holds the head. This makes it possible to use either company’s replacement heads on any machine with a 5/16” shaft. Small machines such as Glastar’s SuperStar and DiamondStar and Inland’s Wizling have synchronous motors that drive a 3/4 inch head at about 3,500 RPM, but do not have the torque to drive a 1 inch head. Loading such a machine with a 1 inch head will cause the motor to overheat and can destroy the machine. If you need to drive the larger head, get a larger machine with more torque, such as a Glastar G8 or an Inland Wizard. Change the water in your machine a lot, and clean out the glass paste while it is wet to avoid breathing dry glass dust. There is nothing special about the sponge, they wear out quickly and should be replaced frequently; you can make a new sponge from a kitchen sponge with your scissors. In our shop we don’t use coolant additives in the water, they don’t seem to help much. Just good clean water! In a commercial shop such as ours we keep several routers ready with different heads for different jobs. We use foot-switches to give hands-free convenience. Eye protection is important; either wear safety glasses or get a face shield for your machine. A good trick is to use an old fish tank turned on its side for a combination splash guard and face shield. It’s neater, and glass is easier to clean than plastic. Don’t leave your router’s head in one position for years, because it might get stuck. 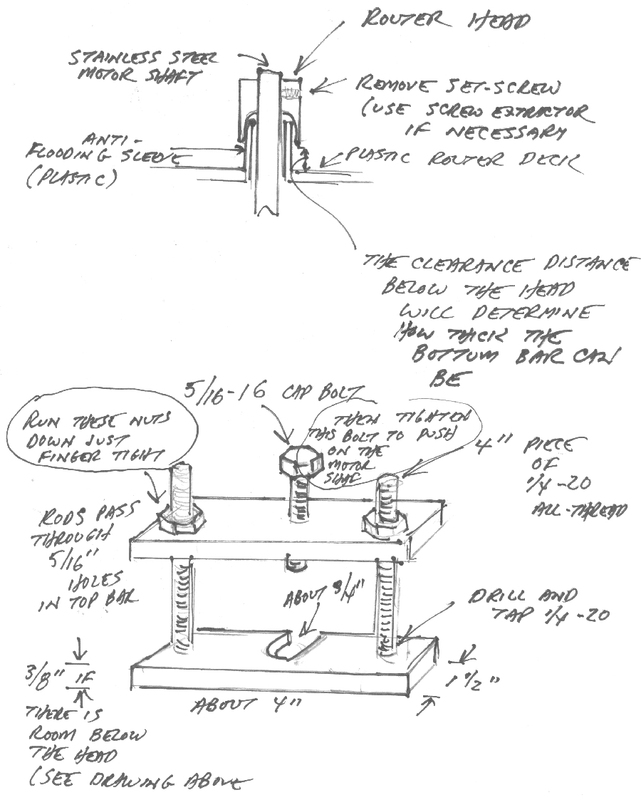 You can remove a stuck head with a homemade puller, a drawing on one is shown below.